The Sip 'n Dip Lounge still looks very much the same as it did when it was established over fifty years ago. When it was built in 1962, the O’Haire Motor Inn was considered one of the finest motels anywhere. Travelers were impressed with the modern amenities included in each room (coffee pot, iron, ironing board), but what was most impressive was the tiki bar that was built with the motel. People may not expect to see one right in the middle of Montana, but tiki bars were very popular in the fifties and sixties (perhaps because Hawaii had recently received statehood). Live mermaids add a touch of magic to a charming Montana paradise. The most magical feature of the Sip ‘n Dip is the mermaids. A glass wall, original to the building, allows bar patrons to see underwater swimmers in an indoor pool. However, mermaids didn’t start appearing until 1997. Now, you can see mermaids at the bar five nights a week. The Fishbowl, the most popular drink item at the Sip 'n Dip Lounge. The Sip ‘n Dip Lounge is young compared to other historic bars we’ve discovered. Even so, this unique dive has changed very little over the past fifty years. The concrete structure has remained unchanged. 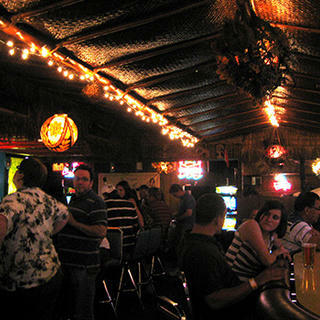 It also retains much of its original tiki decor, including its bamboo and netted ceiling, which continues to contribute to the charm of the lounge and the entire building. For decades, the Sip 'n Dip has attracted a diverse crowd, with visitors and regulars of all ages, looking for a paradise in the Great Plains. Hours: Mon.–Sat. 11a.m.–2a.m., Sun. 1–10p.m. Don’t Miss: The mermaids, Tuesday through Saturday evenings, or Piano Pat, Wednesday through Friday evenings. You’re Having: The Fishbowl, a blue mixture of juices and alcohol in a large, 64-ounce cocktail glass. Best Yelp Review: "Imagine crawling through a desert, desperately hoping for someone to release you from your pain no matter how--and all of a sudden hitting this oasis of joy. That's the Sip 'n Dip … Try the "fish bowl", a giant glass full of blue-colored alcohol. I don't know what it was, but it was delicious and a rather elegant way to enter the magic kingdom of befuddlement. Their choice of beer is great and their appetizers are good." Nick Totten was an editorial intern at the National Trust. He takes particular delight in historic museums and libraries. In addition, he enjoys performing music, playing with words, and appreciating the local sites and views on foot.